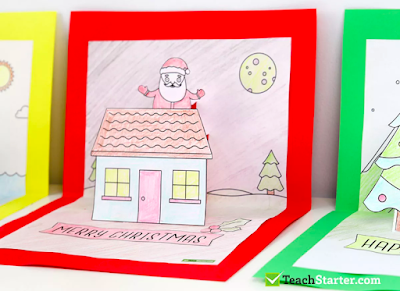 Teach Starter is always adding new resources to their collection and they have some awesome Christmas activities to keep your children busy and engaged across all curriculum areas. Do you find that students have trouble getting started with their writing because they don't have any ideas? Or maybe they have too many ideas and need help narrowing them down? 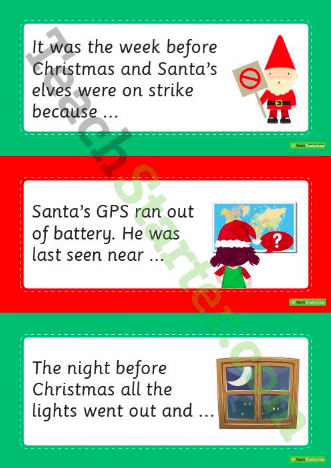 At this time of year it's always fun to do some Christmas themed narrative writing and these sentence starters are a great option. The whole class could all do the same one, students could choose the one they want or even pick one at random to really challenge them and stretch their imaginations. Once completed why not bind them all together to create a class Christmas book? My Year 2s are getting so good at narrative! They are working hard to ensure that their stories are interesting and engage the reader. I can't believe this bunch are nearly Year 3s! Teach Starter also has some fun Christmas page borders which would make these stories look even better. I did these funky reindeers with the Year 2s as well and they absolutely loved them! From what I hear they have been a very popular Teach Starter download. We used them as a mindfulness drawing activity to start with - filling each line of the reindeer with detailed patterns using black fine liners. 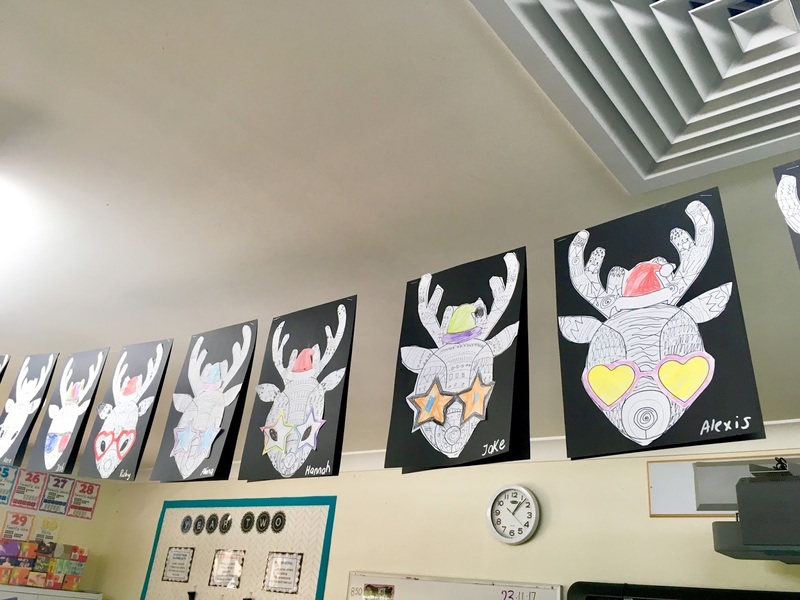 I also encouraged the students to ensure that their reindeer was symmetrical. The classroom was so silent you wouldn't believe it if you walked in - they were so engaged. 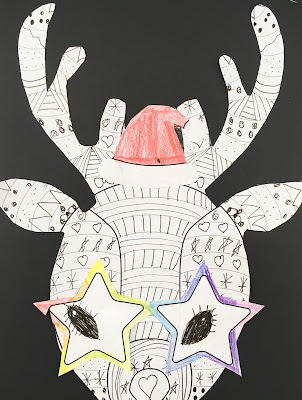 Once the patterns were completed we used colour for the hat and glasses to complete the reindeer and finally cut them out and stuck them onto a black card background. They look so effective! 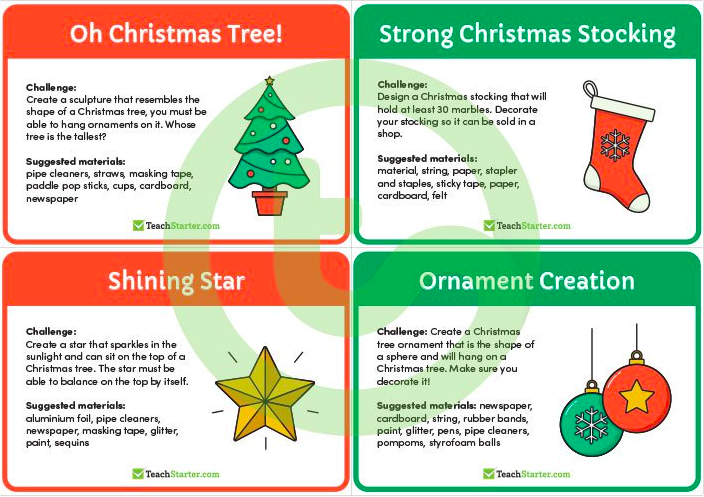 I have made STEM a real focus this year on my blog, so I was excited to find these Christmas STEM challenge cards. There are some really cool ideas in this set such as design an elf on the shelf zip line, create a package for the Christmas cookies you have baked and design a maze using candy canes. These are great for all ages and could easily be modified for younger students. Every year it's always a nice idea for your students to make a card to give to their families (I might even do these fun pop up cards with Miss M to give to her grandparents). I love how there is a summer or a winter option. In the last week of Term 4, everything is being finished off a rounded up for another year. I always like to have a booklet for students to work through at their own pace - they can choose the activities they want to do and anything not completed they can do at home when they start school holidays. Plus there's no marking for you! This pack wold be ideal to print one for each student and staple together to make their own booklet. 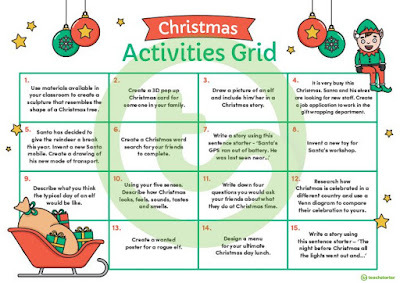 A brand new resource which has just hit the website is this Christmas Activities Grid. Kind of like a menu where students can choose which activity they are interested in. Perfect for the last week of school! Finally - if you are looking for some lesson plans more about "Celebrations" in general rather than specifically Christmas, this Celebrations around the world pack might be just the thing you are looking for. 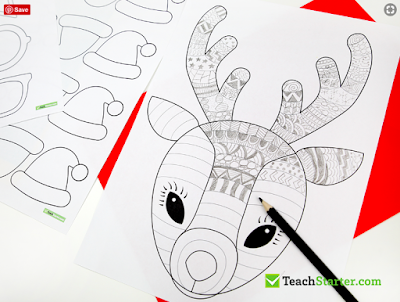 PS - I've just heard the news that Teach Starter is having a Black Friday sale! You can get 50% off your Teach Starter membership for 12 months. Just enter the code BLACKFRIDAY (offer ends midnight Monday 27th November and excludes upgrades, renewals, school and group plans). This is a great time to sign up for 2018!! 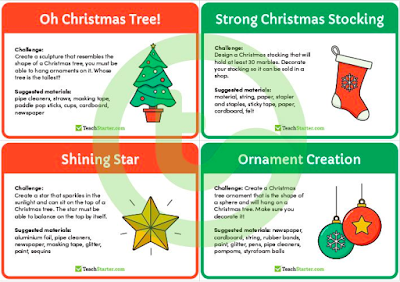 Hope you like these Christmas resources as much as I do!